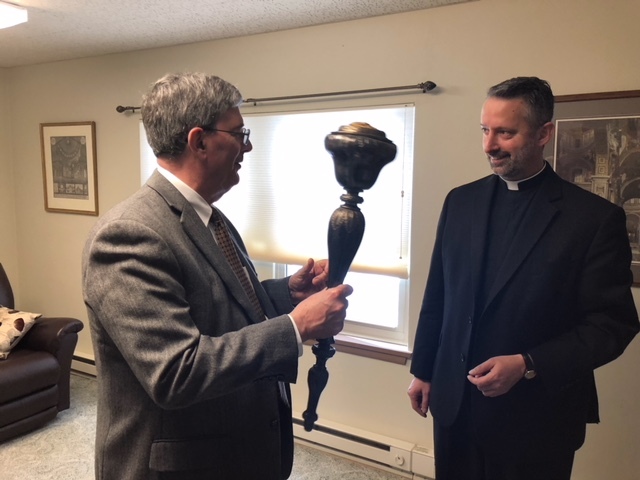 A ceremonial mace is a highly ornamented staff of metal or wood, carried, in Catholic ceremonies (or in secular, civic ceremonies) by a mace-bearer or, in Italian, by the papal mazzieri. 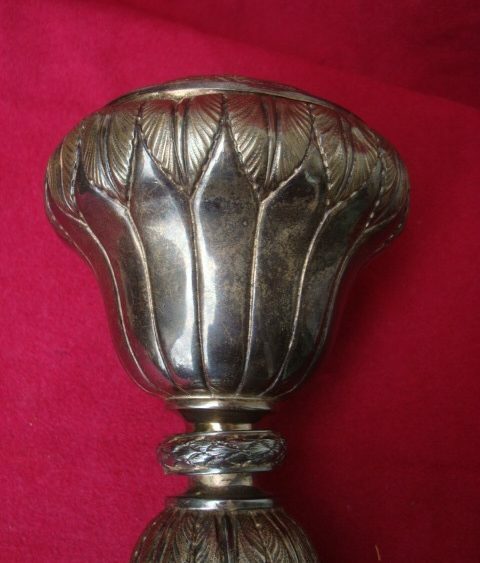 It was intended to represent the official’s authority. 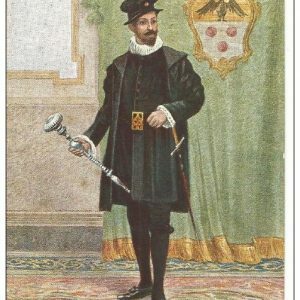 The mace was originally used as a tool to push crowds away from the pope. 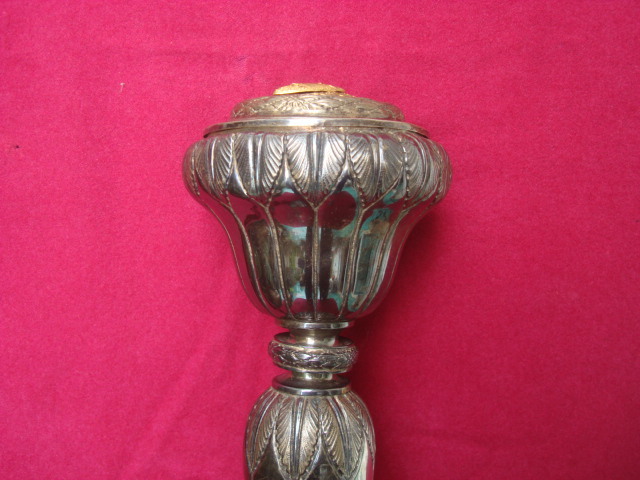 Processions often feature maces, as in parliamentary or in formal academic occasions. 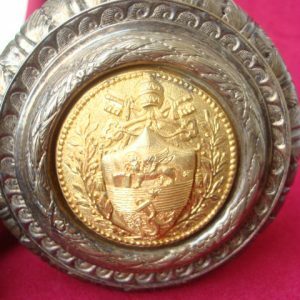 Though not limited to the Catholic Church maces used to be carried before cardinals and popes in papal ceremonies until the papal court was dissolved by Pope Paul VI on March 28, 1968, through a formal letter known as a motu proprio. 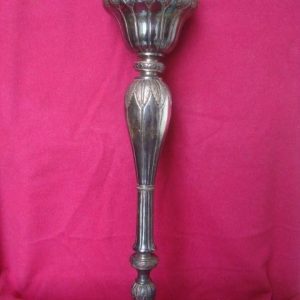 The papal mazzieri, or mace-beareres, took their name from the wrought-silver mace carved with the bearings of the pope who had appointed them. 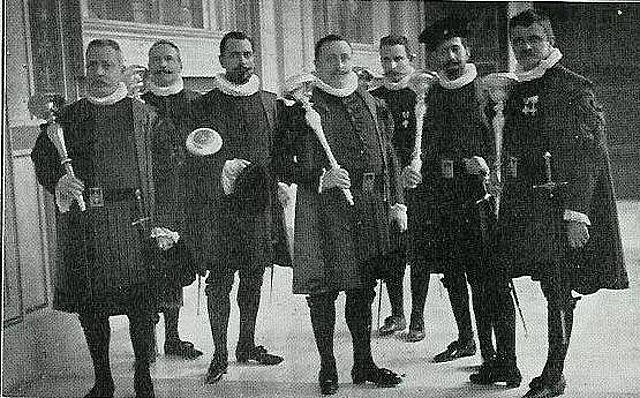 The mace-bearers, usually nine in number, were chosen from among those close to the pope and were constituted into a college headed by a deacon. 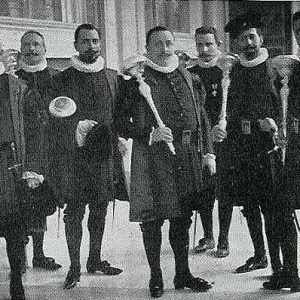 They were at the service of the Cappella Pontificia and answered to the master of ceremonies. Their origins may go back to the ancient servientes armorum, a security corps created by the Roman popes to ensure their safety and to serve as custodians of the apostolic palaces. 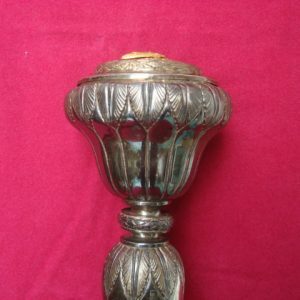 While papal ceremonies were taking place, the mace was carried high on the right shoulder, resting in the palm of the right hand; when not in use it was tilted downward under the left arm. 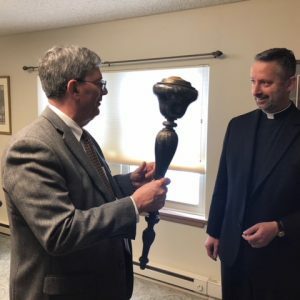 Two of the mace-bearers were appointed to the honorary role of attending the episcopal consecrations held in Rome, and they headed the procession, leading the newly elected bishop through the church while the “Te Deum” was being sung. 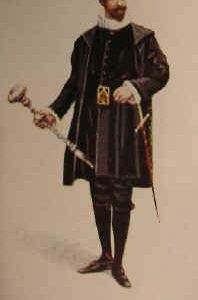 The mace-bearers’ costume consisted of black livery bordered with black velvet and a purple soprana trimmed with lace work; from their shoulders hung fake sleeves of cloth or twill; another piece of velvet garnished the headdress and a sword hung at their flank. 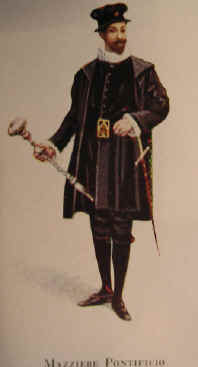 Various other costumes, as can be seen in these pictures, were variations on the black, traditional ones. 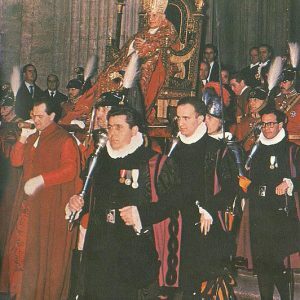 The duties and category of the mace-bearers were abolished in 1968 by Paul VI as part of widespread changes to the Casa Pontificia. 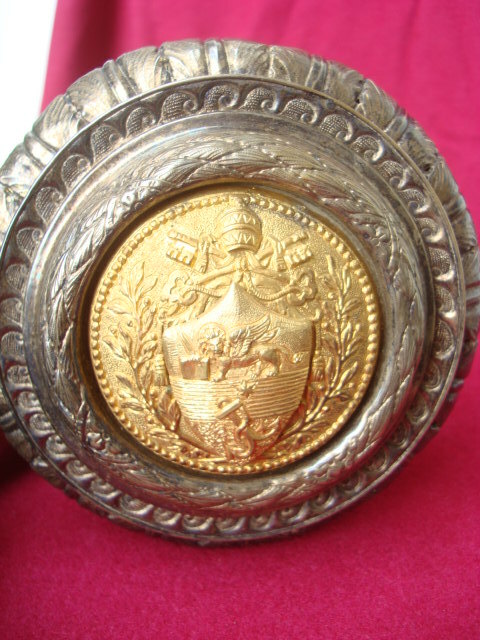 This particular mace is made of silver and bears the coat of arms of Pius X. 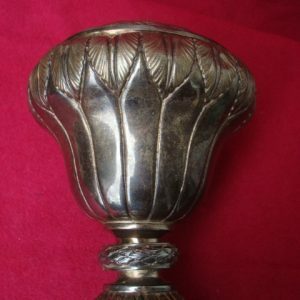 The head of the mace is a flattened sphere, with circular embossed indentations and downward-curving leaves; the lower part of the head is vase-shaped. 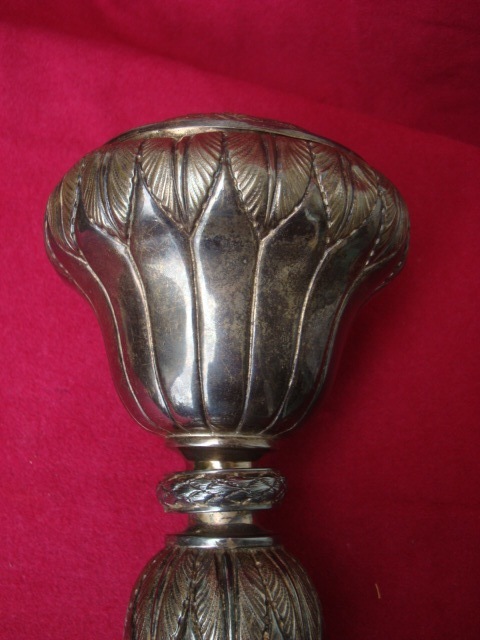 The shaft has two rings and is embellished with finely chiseled leaves and whorls; the lower section is gilded and ends in an inverted bell shape. 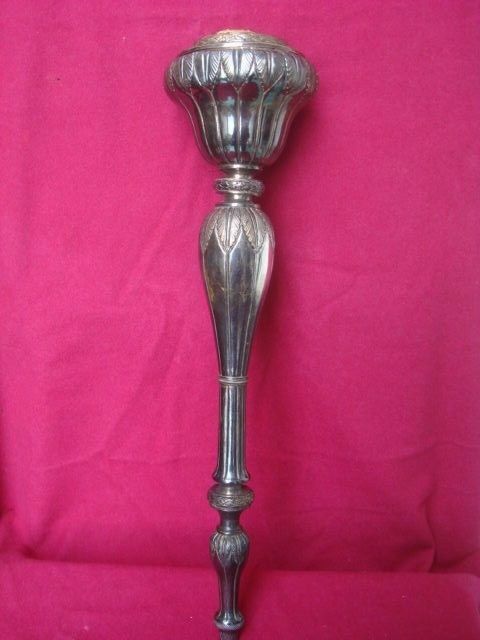 This mace was used during the pontificate of Pope Saint Pius X. It is an incredible and rare addition to this Collection, made even more so because of the canonization of Pius X. Note: The video featured below shows Pope John XXIII being carried on the throne, the sedia gestatoria, and if you look closely in the beginning of the video you can see the mazzieri surrounding him, carrying their maces. It is a glimpse of them in their work as protectors of the Pope during a ceremonial occasion. In the Papal Chapel, the following positions were altered or destroyed: Palatine Cardinals (Cardinali Palatini); prelates di fiocchetto; Prince-Assistants to the Throne (Principi assistenti al Soglio); Majordomo of His Holiness; the Interior Minister; Commander of Santo Spirito; Roman Magistrate; Master of the Sacred Apostolic Hospice; Chamberlains of Honor in abito paonazzo; Secret Chaplains and Secret Chaplains of Honor; Secret Clerics; Confessor of the Pontifical Family; Candle-Carrying Acolytes (Ceroferari); Common Papal Chaplains; Porter-Masters of the Virga Rubea; Guardian of the Sacred Tiara; Mace-Bearer; and Apostolic Messenger (Cursori Apostolici). Of these offices, the suppressed offices of Secret Chaplain and Secret Chaplain of Honor, Secret Cleric, Acolyte Ceroferari, Common Papal Chaplain, and Porter-Masters of the Virga Rubea were consolidated under the general title of “Cleric of the Papal Chapel”. The Papal Family underwent even more radical changes. Abolished and considered were the following titles: the Palatine prelates (i.e., Majordomo of His Holiness, Master of the Chamber [Maestro di Camera], Auditor of His Holiness); Master of the Sacred Apostolic Hospice; the Hereditary Quartermaster General of the Sacred Apostolic Palace (Foriere Maggiore); Master of the Horse to His Holiness (Cavallerizzo Maggiore di Sua Santità); General Superintendent of Posts; the Keepers of the Golden Rose; Secretary to Embassies; Esente of the Noble Guard of Service; Chamberlains of Honor in abito paonazzo; Chamberlains of Honor extra Urbem; Secret Chaplains and Secret Chaplains of Honor; Secret Chaplains of Honor extra Urbem; Secret Clerics; Common Papal Chaplains; Confessor of the Pontifical Family; and Secret Steward (Scalco Segreto). The Master of the Sacred Palace (the Pope’s Dominican theologian) has been renamed Theologian of the Pontifical Household. Currently the post is held by Fr. Wojciech Giertych, a Polish Dominican former student of and professor of theology at the Pontifical University of Saint Thomas Aquinas, Angelicum, who was appointed by Pope Benedict XVI in 2005 to replace the Swiss Cardinal Georges Cottier, now Theologian Emeritus of the Pontifical Household. 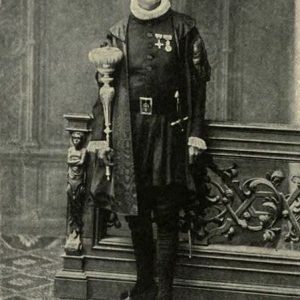 The titles of Secret Almoner and Sacristan of His Holiness were changed to Almoner of His Holiness, and Vicar General of His Holiness for Vatican City, respectively, and the responsibilities of the Secretary to Embassies and Secretary of the Wardrobe were commuted into the office of the Prelates of the Antechamber. 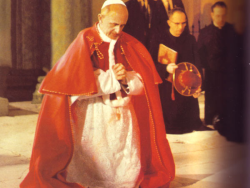 Domestic Prelates and Secret Chamberlains Supernumerary remained part of the Papal Family, but were henceforth to be called Prelates of Honor of His Holiness and Chaplains of His Holiness, respectively. 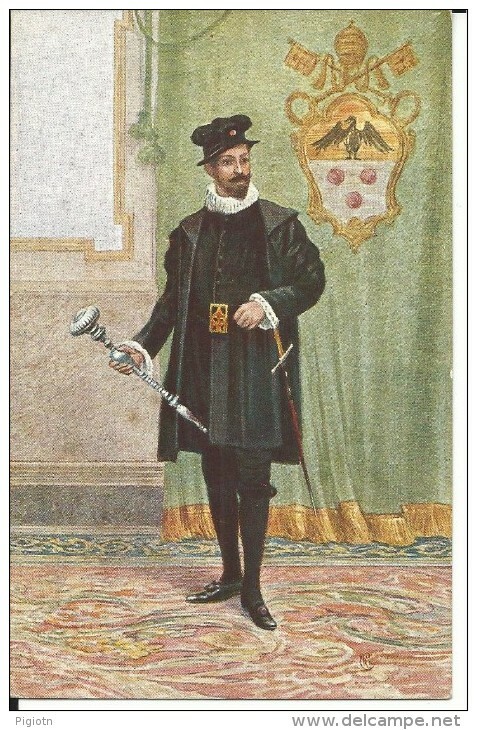 Likewise, the Secret Chamberlains of the Cape and Sword (di cappa e spada) were retained under the title Gentlemen of His Holiness, and the Bussolanti took the new name of Attachés of the Antechamber. The Camerieri Segreti Partecipanti were outright abolished, as was the title of Sub-Auditor (Subdatarius). 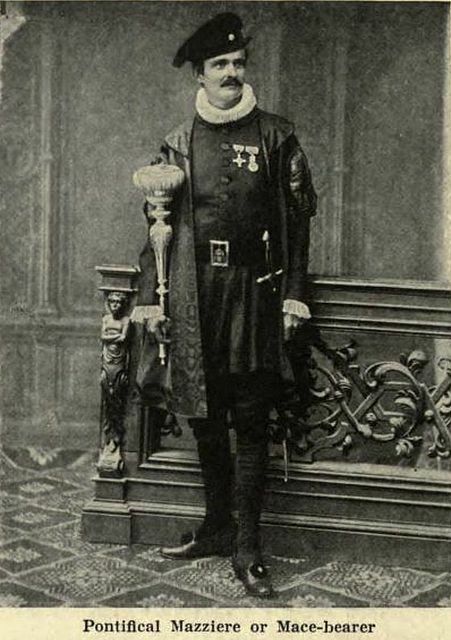 There was also a change in honorific ecclesiastical titles, which were reduced to three categories: Protonotaries Apostolic (de numero and supernumerary), Prelates of Honor of His Holiness, and Chaplains of His Holiness. All the other categories of Monsignori were abolished.